Do you adore painting, drawing or sculpting? Are you naturally creative, a great communicator and feel comfortable with computers? 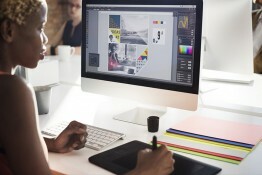 You may just want to explore the possibility of pursuing a career in graphic design. • Collaborating with colleagues and clients from the start to ensure all goals of a particular project are met. • Brainstorming creative concepts and seeing them through to completion. • Revising work according to client and director feedback. Most jobs require a Bachelor’s Degree in Graphic Design or an arts-related field. Successful graphic designers also take courses in business and marketing, and internships can help build skills and an understanding of the various aspects of the field. Throughout your education you’ll learn the science behind using fonts, colors and space to effectively create a desired message for print or digital projects. Good news is you can start building a solid graphic design foundation by taking high school art and design classes. These along with a portfolio may actually be a requirement when applying to college programs, so be sure to collect the pieces you’re most proud of. According to the US Bureau of Labor Statistics, 261,600 people held graphic design jobs in 2014, and the outlook shows it will remain the same through 2024. Most work full time, however, 1 in 5 are self-employed, meaning they may not hold typical 9-5 hours and need additional skills to help them market themselves, acquire new clients and manage invoicing. The median annual wage for graphic designers is $45,900, although experienced designers and art or creative directors can expert to earn up to around $80,000. Im Timorense..i realy love the design graphic.. my dreams its become PRO DESIGN GRAPHIC… i dont have high education.. im just learn by tutorial video. I’ll fight to get scholarship. Me Too! I like anime especially! I think it would be fun to be a Graphic Designer! !